The above link shows the breakdown of the population in Elk township for the 2010 census. There is only 49 of us. The 2000 census showed a population of 51 so we are down 2. The area covered by the township is 72 sq miles, that is 1.46 sq miles per person. Leetonia is actually the only "town" within the borders of Elk township. As most of you know Leetonia is basically a ghost town; no food, unless you bring it, no gas, no bars, and no churches. Just a bunch of part-time camps lumped together. This map link shows you the outline of our county. Ninety percent of it is State-owned forest. Now I know why it can be so long to see someone in the middle of winter. As isolated as it is up here there is something about living here that hooks you and makes it hard to even think of leaving. Maybe its the quiet walk through the forest listening to birds and seeing a deer, turkey or bear pop up. Maybe its the sound of the creek gurgling down towards the Atlantic Ocean or the tapping of the rain against the window after a long dry spell. Sometimes it is a blanket of white snow that silences everything and decorates the branches of the trees and bushes; so quiet you can hear each snowflake fall. This lack of sound scares some people and they rush back to their noisy cities and streets others feel like they are home and never want to leave. Which one are you? Update on bear issue. Since electric fence no hummingbird feeders have been drank. We did see a bear coming down the road one night as we sat on the porch. Scooter ran it off. So if he had any thoughts of coming to check things out, he changed his mind. Three Baby bears got stuck in a dumpster over night. Mama bear sat by the dumpster all night listening to her cubs cry. Shirley and Tom Schenk, help three bear cubs escape from a dumpster in Ruidoso, N.M. Mountain girl, Paula, logging off. Strange things happen when you least expect them in the woods of Tioga. I needed to go to town to pick up some lumber for a job I am working on. However, they have been hauling gravel in for some of Leetonia road and this involves heavy truck after truck coming down the road to dump gravel. It is difficult passing someone on these roads when I pull the trailer to pick up materials so the thought of passing several dump trucks loaded with gravel did not appeal to me and I decided on an alternate route. After I made it up to Wilson Point Road I turned right and headed to Ridge Road, which I would follow down to Schumaker and out to Elk Run therefore avoiding the trucks on the narrower part of Leetonia Road. This way is longer and the impatient part of me resisted, the cautious part of me won and I resigned myself to going slower way over the somewhat rougher and narrower road. I decided rather than fighting this change I would look at it as an opportunity to see parts of the woods I don't usually travel on...sort of a mini-vacation. The narrower road has its charm and as I passed the site of the old Lee Fire Tower, I remembered climbing up in it as a kid to see the Forest Ranger stationed there. It waved back and forth in the breeze as you got higher. My mother afraid of heights never climbed up the tower as she had a hard enough time just watching us go up. I wished I had a picture of the tower. I don't know why we never took any pictures. Now it is gone and so with it the chance for any pictures. I now turned left on Ridge Road and noticed some black shapes on the road a head of me. Scooter noticed them too and watched closely as the shapes flapped their way into the air. 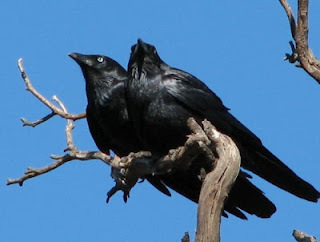 Two beautiful Ravens now flew just above me down Ridge Road. They didn't seem in a hurry and flew almost in synchronicity. Down the narrow road they guided me not flying any faster than I was driving; not seeming at all worried about the noisy trailer I drug behind me that squeaked and popped over every pot-hole. The longer they stayed in front of me the more I marveled at them. The Native American's view the Raven as shapeshifter and magician of the woods. I wondered what kind of magic I would be seeing. They continued down the road so far I thought for sure they might take me all the way to town. But finally, one of them pulled up and sat on a limb watching me drive under then shortly after that the other followed suit. Ravens and crows are some of the smartest birds on this planet able to use tools to get to food and figure out some pretty complex problems. Now I had been given a tour of Ridge Road through the eyes of the Raven all because of a detour that was the magic of the Ravens. Sometimes the best things in life come through its detours if you just look. Enjoy all your detours courtesy of the Ravens of the woods of Tioga Forest. Mountain girl, Paula,logging out. After being woke up night after night to dogs barking at one particular bear who has learned the art of draining hummingbird feeders, I put in an electric fence. The fence runs far enough out the bear can't reach the feeders and goes on three sides of the house. I decided this to be the safest alternative to retrain the bear. Shooting or spraying anything on the bear involves going outside as he is always next to house and I can't really get a good line on him from any windows. Of course the other solution of not having hummingbird feeders will be my last resort. The bear is getting braver and not listening to my yelling and the dogs barking inside their enclosed fence area. This concerns me as there is only one more step for him figuring out he is much stronger than any of us. I am only charging the fence at night and I am placing a hot dog on it to entice him to grab it with him mouth. This will give him a better shock grabbing it with a wet mouth over hitting the line with lots of fur. One or two good shocks should keep him away and save me from the danger of a face to face confrontation. I used this fence to stop a bear from biting another cabin and it didn't take long for them to learn. I will update you as to the progress. He didn't show up the first night I had it up but maybe tonight I will get lucky. Mountain girl, logging out. The dogs were quiet yesterday until early evening as the temperature dropped and I opened the windows which made it easier for them to hear and smell all the wild things outside. The hummers were busy getting their last feeding for the night and I was getting comfortable in my chair for a quiet evening of reading. All of a sudden the dogs went crazy barking and trying to see out the windows. Well of course I had to look also. I went to the kitchen window and looked up the hill but saw nothing. The hummer feeders looked fine as I took inventory until I got to the living room. The dogs were still barking and I looked out the little window above where I usually sit and there was a 300 pound bear standing while tipping the hummer feeder catching all the sugar water in his mouth. He got almost every drop. I ran out to the porch and yelled at the bear to go. He looked at me and started running up the hill while still keeping his eye on me until he was out of site. Upon further review he had drained a feeder on the side of the front porch also. The one good part of this story is the bear found out how to drain the feeders without tearing them down and wrecking them. I am thankful for that. I still love watching the bears. That was maybe a little too close for comfort. I thought about grabbing my IPOD to take a picture but the sun was going down and I didn't have enough time. If you have an IPOD you know they take forever to boot up unlike the bears who can move quickly. Paula suggests we put an electric wire under the feeders to get the bears to leave them alone. I would have to turn the electric off to fill the feeders. Sounds like a lot of trouble. Her other suggestion was to take the feeders inside for the night. That's even more trouble since I have up to 16 feeders around the house. Besides the bears have got into the feeders mostly during daylight hours. I guess I will just have to keep a lookout for them. With sugar prices so high we can't afford to feed the bears. The hummers usually go through at least a gallon of sugar water a day as it is. It will be even more once the babies start flying in. Paula's twin nieces Abby and Hailey, in the picture above missed this adventure since they all went to NJ to see Paula's Great Aunt Pauline who is 97. They look scared like maybe they were chased by a big bear. Paula and the gang will be back home tomorrow for more hummer and bear watching and driving me crazier. Hope everyone is having a fun celebration today for July 4. The other mountain girl (Lee Anne) logging off.